His art-house horror hybrid starring Casey Affleck and Rooney Mara is the biggest buzz title of the summer, but David Lowery says he’s still figuring out what his movie about ghosts, secret notes and hidden meanings is all about. 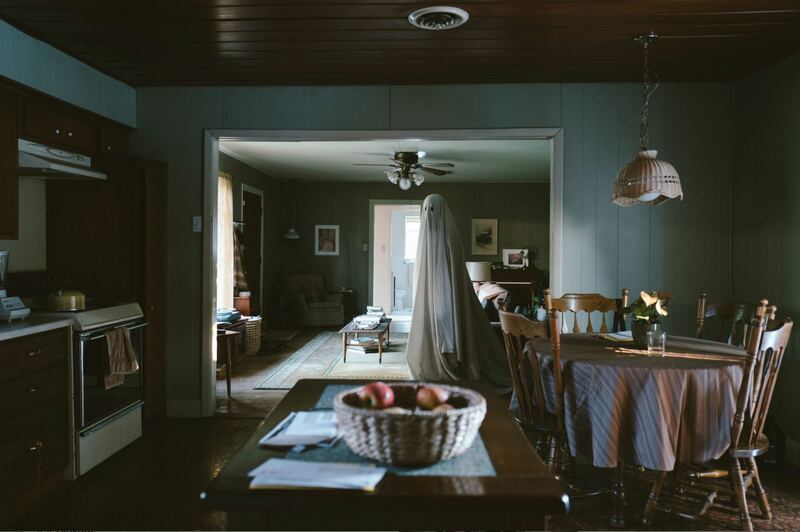 David Lowery has been talking about A Ghost Story since January, when it premiered at The Sundance Film Festival. But by year’s end, there’s a good chance everyone will be talking about this low-budget art-house-horror hybrid starring Rooney Mara, Casey Affleck and a ghost walking around under a sheet with two cut-out eyeholes. Ex-Press: You’ve been talking about this movie for a while now. Have there been any surprises? Has your interpretation changed? Lowery: There haven’t been too many surprises in terms of interpretation. But there have been comments, insights that I’ve found to be very illuminating. So I feel like I’ve gotten to know myself a little better and gotten to know the movie a little better. And it’s been a wonderful experience because I feel I’ve gotten more in touch with what I’ve made because people are highlighting real things that were potentially subconscious, or that I haven’t thought about in an active sense and that’s been really nice. Like just in the interview I did five minutes ago someone pointed out a connection to a movie that I had definitely seen, but totally forgotten, and it was so obvious to me once he mentioned it, but I had forgotten it. And hadn’t thought about it in years. Ex-Press: Wow. What was that? Lowery: It’s the Wong Kar-wai movie In the Mood for Love, which has a very prominent moment where a character hides a note for someone else in a wall. Ha, ha… it’s got a much more symbolic quality in that movie. It’s tied into a reference to Angkor Wat — the temple… [in Cambodia]. And it’s a tradition you do there. But I definitely have seen that movie many times, but not in the last ten years, and definitely been influenced by Wong Kar-wai in general. And truly, that scene and the meaning implicit in it was on my mind on a subconscious level when I was writing the script, but I was completely oblivious to it until a journalist just brought it up now. And that was a wonderful discovery — to be reminded of that scene. And realize the impact it had on me without me even realizing it. Ex-Press: That’s interesting. I’ve seen the film and I don’t remember the note. Just the temple. As far as your note, or Rooney’s note: Did you know what’s on that piece of paper? Does it matter? Lowery: The easy answer is it doesn’t matter. If it did matter I would have found something to show. I would have shown it in a way that would be meaningful to an audience. But because in the writing and shooting and editing of it, I was never convinced it would matter. So I can honestly say I don’t know what the note says. We shot it in a way that we don’t know what Rooney is writing. I told her to write something that was meaningful to her, and I could have looked over her shoulder and seen what she wrote that day, but I didn’t because I was too busy behind the camera. And now that it’s done and that note went down with the house, she’s keeping mum about what it said. She says she forgot. I don’t believe her. But nonetheless… It shall remain a secret. Ex-Press: I read you wanted to see if you could pull this off as an idea. At what point did you realize this was going to work? Lowery: There were a couple of stages where I found my confidence growing. Going into it I was completely confident. I had no doubt that it would work, but once we started shooting, those doubts evaporated to a certain extent. But it wasn’t until the third week of shooting that I started to regain that confidence. I edited together 20 minutes of footage in a very particular fashion and that was enough to indicate to me that we were on something of a correct path. I wasn’t sure if we were out of the weeds yet, but I kind of felt we knew what we were doing, even if on a day-to-day basis I was completely freaking out. And once we got into the latter stages of the editing process, where the film really came into being and was existing on its own terms, I felt that we had something … that it was exactly, not exactly, the film I set out to make — because no film ever is — but it was pretty darn close. And it worked as a movie and it made me happy as an audience member. And that’s what I always try to remember as a filmmaker: to make a movie that I would enjoy if I went to the movies. …I wasn’t sure if we were out of the weeds yet, but I kind of felt we knew what we were doing, even if on a day-to-day basis I was completely freaking out. Ex-Press: And you totally succeeded, as far as I’m concerned. Even though it’s all about death. What was the original seed? Lowery: The inciting incident was an image of a ghost in a house all by himself, and that ghost was the classic Halloween costume bedsheet ghost. That was it. The image made me laugh. And then it made me feel sad and lonely and melancholy. I felt if I could make a movie that accomplished all that, then well, I am doing justice to this image and it would be a movie worth making. The inciting incident was an image of a ghost in a house all by himself, and that ghost was the classic Halloween costume bedsheet ghost. That was it. The image made me laugh. And then it made me feel sad and lonely and melancholy. I felt if I could make a movie that accomplished all that, then well, I am doing justice to this image and it would be a movie worth making. Ex-Press: As far as your understanding of this image, where does it come from. How did we ever come to see ghosts as sheeted characters? Did you research it? Lowery: A little bit. I didn’t dig too deeply into it, but I understand it has a history on the stage in theatre. The origins of it and the theatrical representation of ghosts come from burial shrouds and the idea of a revenant returning to earth in the shroud in which it was buried. So I did go through the history a little bit, but I haven’t gone through to examine all the many representations and deviations from those representations as they existed throughout history. Ex-Press: You kind of make us rediscover the whole idea of the sheeted ghost when you reveal Casey Affleck walking in the sheet that was covering his body… Was it hard to convince him to do this. And was it him under the sheet the whole time? Lowery: It was him enough of the time that I had to convince him to do it. But the wonderful thing about working with actors with whom you have a relationship with is that trust is already there, to a large extent. So even with these two actors it was a significant leap of faith. They trusted me… I didn’t have to build that trust the way I had with hem on the first film (Ain’t Them Bodies Saints). We had already done that part of the process and we could just jump off the cliff with this movie and all feel confident that there would be something there to catch us before we hit the bottom. I Can See Your Halo… Is it just me? Or do you feel something strange. 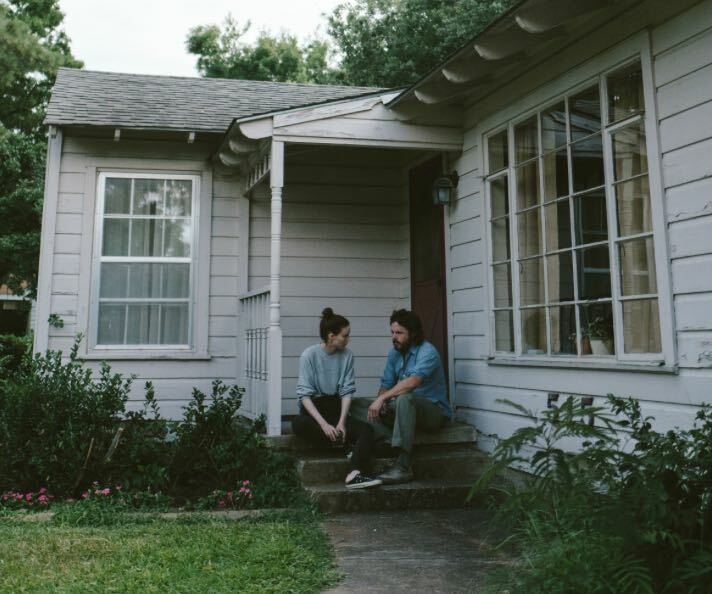 Casey Affleck plays a ghost in A Ghost Story, shot in Texas, using a house slated for demolition. Designers built the kitchen and installed cinematic air-con. Ex-Press: What is the most important thing to infuse in your actors. What is the nature of your connection with them, is it just professional. Or is there something generational going on? Do you feel you are on the same page as far as the art goes? Lowery: Well we are all vegan. And that goes a long way. We can eat together. Ex-Press: Rites… True. And in some ways, being vegan is a bit of a generational marker, no? There’s a larger awareness behind these decisions. Lowery: Yeah, there is. But we like the same things. I’ve always kind of subscribed to the idea that it’s important to work with people who have the same taste in music as you do. And while that’s a reductive and simplistic way to go about hiring people, it nonetheless happens to be a great barometer. And Casey and Rooney and I all like the same things. We all have the same interests. There are things they like that I don’t like. It’s not 100 per cent black and white. But we all just get along and have the same goals as filmmakers. Even though they are working in front of the camera, they are still filmmakers in their own right and they like the same challenges. They like to engage with the art on the same level that I do. And they don’t want to limit themselves to a traditional type of storytelling. So all those things combine to create a very productive and exciting creative environment and one in which we all feel comfortable. Ex-Press: Do they teach you things? I guess every film has its own lesson book. Lowery: Yeah. I feel working with actors has always been a significant challenge for me because I have trouble communicating my ideas. I have an easier time writing my ideas than I do communicating them vocally. Even talking to you now, I am like… my brain is racing a million miles a minute trying to construct these sentences in a way that makes sense. Usually, when I am trying to talk to an actor, I am so stressed out already that my words turn into a jumble, to the point where I am shocked — shocked — to hear myself on camera giving a little bit of direction between takes. I am shocked that anyone can understand what I am saying. But on this film, I really learned to trust the actors and also to not be afraid to tell them no. Trusting actors is always a tremendous thing to do. I learn it anew on every film. To work with that trust and use that trust and allow them that trust, but I also have learned that just because an actor has an idea that might be a great idea that doesn’t mean I need to follow it. I don’t need to run down every possible avenue that they might open up for me. So on this film it was really helpful to discuss things with them, and go into depth about the characters and their circumstances and to really dig in, but also to not shoot all of that. Whereas in the past I would have been like let’s talk about it, let’s figure it all out, and then let’s shoot every bit of this. And that’s not practical. It can run you into the ground and reshape the movie in negative ways if you aren’t careful. So it was valuable on this movie to realize that… it was within my realm of responsibility to be able to say no to some of those things. Usually, when I am trying to talk to an actor, I am so stressed out already that my words turn into a jumble, to the point where I am shocked — shocked — to hear myself on camera giving a little bit of direction between takes. I am shocked that anyone can understand what I am saying. Ex-Press: Is it hard for you to say no? You seem like a very sweet person and maybe this could be an issue for you? Lowery: It’s not random, but there is no set path laid out before me. I definitely have my reasons for taking any given movie that I’m working on. There’s always a reason behind it that feels very related and intrinsically related to the film I made before that. So each film feels like a stepping stone to the next one. But I never know what that next one will be. So I don’t know what my next movie will be right now, but I know that once I am making it, it will feel like exactly the right movie. Ex-Press: Given that you come from the family of a theology professor… There is a lot of spiritual stuff going on in this movie. As far as constructing your understanding of our place in the universe, and framing existence. I loved what you did with the aspect ratio, by the way…(the film is shot in a far more square aspect ratio of 1.33:1 as opposed to a now-standard widescreen rectangle of 1.85 or 2.4) but I wondered, as I watched, is there a god in this frame? This movie seems to be a bit of a query in terms of what it’s about… Do you have anchor points, where are you at metaphysically? Lowery: I don’t have any anchor points at the moment. And I am okay with that. I grew up with a profound, very strong anchor in those regards, and at a certain point, I became unmoored from that rooting and that was a comfortable thing for me. I never regretted that. I never rejected the theology, or the religious upbringing that I had. I just felt like I needed to define myself apart from that. No need to affront it. I just grew apart from it. And it was a very natural and organic thing and I’m still growing as a human being. So I am sure I will wind up somewhere else in the future and I don’t know what that will be but I am very comfortable being adrift. I don’t feel it is creating a deficit in my life nor do I feel that I need to search for something. I know things will come to me as I need them, and if I find myself lacking something, I will pursue it. But right now, I am content to observe and to question, but to question casually. And to see what, you know, what life has in store. The only thing I know to be true is that I will never plateau as a human being. I will never come to the point where I feel I understand everything or that I have made it — I say “made it” with quotation marks. So as I move forward, because I feel life is really just a big case of moving forward, I am comfortable going wherever I might go. I have the parameters that make sense to me, and they might change, but I am open to that change. I don’t have any anchor points at the moment. And I am okay with that. I grew up with a profound, very strong anchor in those regards, and at a certain point, I became unmoored from that rooting and that was a comfortable thing for me. I never regretted that. I never rejected the theology, or the religious upbringing that I had. I just felt like I needed to define myself apart from that. Ex-Press. Because I love the wall opening in the hospital. You present the opportunity for spiritual communion. Yet, the character…. walks away. So… there’s a choice. Another noticeable frame. This other frame of light. Does god exist inside the frame… or…? Ex-Press. It’s scary, at times, the film. Deeply so. Lowery: It has a couple of built-in jump scares. But then there’s there the existential fear that some people feel more than others. But I definitely feel it uses the language of horror films even though it’s not a horror film in and of itself. Ex-Press: I have to let you go soon, but you said at the top of the interview you learned about yourself with this one. What did you learn? Lowery: I learned I can’t be so nihilistic. Nihilism and I do not make good bedfellows. I learned that about myself. This movie set me on a course on how to be more hopeful in my day-to-day life, despite the dire straits that surround us on a daily basis. Ex-Press: Ooooh. So what’s the key to that? How to be less nihilistic? Lowery: I wish I could write that down in words. This film has been a big part of that for me. Ex-Press: Maybe because you made something beautiful. I think the creative act offers redemption at some level. Lowery: That’s a big part of it. And when that experience can engage you on a personal level, It’s very therapeutic. Ex-Press: You sound happy… are you a generally happy person? Lowery: Usually, yes. I am an optimistic pessimist. I have a pessimistic outlook on the world, but I am still hopeful. And that is a nice place to be…. A Ghost Story opens in markets across North America Friday. Old Man and The Gun is currently in post-production. Feels Like Home: Casey Affleck and Rooney Mara sit outside the house, on the same stoop, and the same plane. Photos by Bret Curry, courtesy of A24. Main photo features David Lowery directing Casey Affleck. 1 Reply to "David Lowery Defeated Nihilism with A Ghost Story"